WASHINGTON – Equality now has a stamp of its own as the U.S. 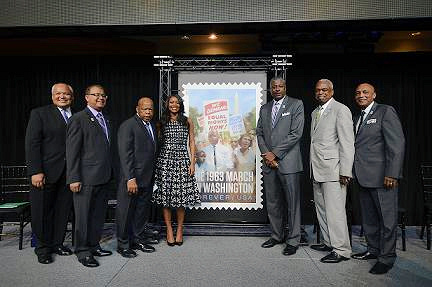 Postal Service introduced the 1963 March on Washington limited-edition Forever stamp to commemorate the 50th anniversary of the historic milestone. For the first time, the Postal Service unveiled the stamp artwork with the help of people across the country. Throughout August, individuals added their photo to the March on Washington stamp on the U.S. Postal Service’s Stamps Facebook page to help reveal a small piece of the stamp. Rep. John Lewis (D-GA), the last surviving speaker at the March, joined The Leadership Conference on Civil and Human Rights and The Leadership Conference Education Fund President and CEO Wade Henderson; U.S. District Judge Alexander Williams, Jr.; Deputy Postmaster General Ronald A. Stroman and Union to officially dedicate the stamp and underscore the importance of this historic event. Fifty years ago, on Aug. 28, 1963, nearly a quarter of a million people came together in Washington, DC, to participate in the March on Washington for Jobs and Freedom. It was then that Dr. Martin Luther King, Jr., delivered his powerful “I Have a Dream” speech on the steps of the Lincoln Memorial, a defining moment of the American Civil Rights Movement. Early in the morning of Aug. 28, 1963, hours before the March on Washington for Jobs and Freedom was to begin, Courtland Cox, a top official from the Student Nonviolent Coordinating Committee, walked to the still-deserted National Mall with the chief organizer of the march, Bayard Rustin. In the quiet, as mist rose from the Reflecting Pool, Cox turned to Rustin. They came. They arrived by bus, train, and car. They bicycled from Ohio, hitchhiked from Alabama, and walked from Brooklyn. One young man roller-skated from Chicago. That day, some 250,000 people joined one another in the hope and belief that change was possible. Wearing their Sunday best, carrying placards, linking arms and joining voices, they filled the National Mall from the Washington Monument to the long shadows of the Lincoln Memorial. In a peaceful gathering filled with music and hope, they gathered to listen to popular artists of the day sing songs of yearning and courage. Speakers from religious groups, labor unions, and major civil rights organizations talked of their belief that the time for change had come, was indeed, overdue. It proved to be a milestone in the civil rights movement. Less than a year later, Congress passed and President Lyndon B. Johnson signed into law the Civil Rights Act of 1964, followed by the Voting Rights Act of 1965.